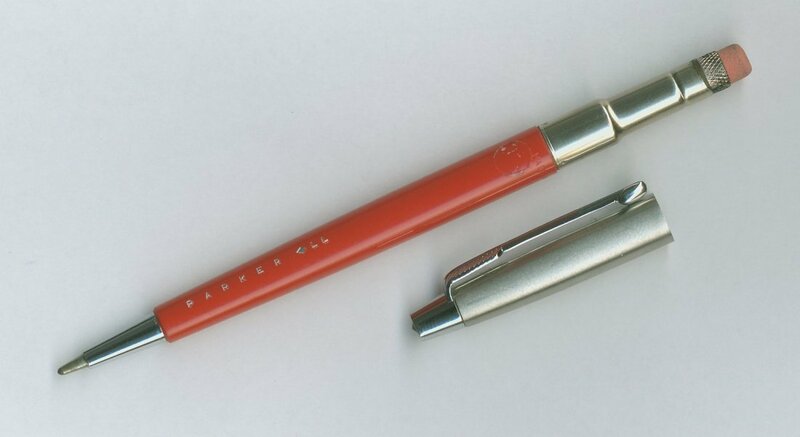 The Parker Liquid Lead pencil was a unique attempt to create a pencil that refilled like a pen. It was introduced around 1955-56 and sold until 1962. One odd feature of the LL pencil is that it does not retract. This, combined with the fact that it looks like a pen, often causes unaware owners to mistake the LL for a dried-up ballpoint with a broken actuator. While some may "write off" (ugh) the LL as a failed product and a non-collectible item, I think it presents a great opportunity to buy and use an old writing instrument at a very low price. But since LL refills are no longer available, how do you use it? It turns out that with a slight modification, a cheap generic ballpoint refill can be used in a LL pencil. The resulting Parker LL "pen" gives you an everyday writing pen that carries an interesting (albeit short) history. Just remember that the point doesn't retract, so it's best used as a desk or portfolio pen - or you have to be careful when placing or removing it from your shirt pocket. Note that this modification is made to the refill only - your LL pencil is not changed in any way and can be switched back to a LL refill if you have one. To modify a ballpoint refill to work in a LL pencil, start with a refill that has a slender body. This is necessary in order to fit within the barrel of a LL pencil. Parker standard refills will not work. I've found that refills from cheap ballpoints are most likely to have the right dimensions. These refills have a plastic body and a metal tip section. You may have noticed that the original LL refills extended out of the barrel for an unusually long reach. 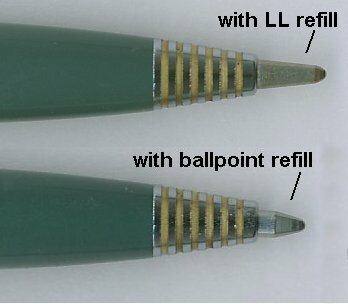 Because of this, your ballpoint refill must be modified to allow it to slide further down into the barrel tip area than a normal ballpoint would do. To do this, the portion of the refill where the plastic body attaches to the metal tip section must be trimmed back to match a LL refill. Be careful that you leave enough plastic in order to hold the 2 sections together. I use either a roto-tool or a craft knife to remove about 1/16 inch of the plastic collar. Finally, trim the refill barrel to the overall length of a LL refill, approx. 3 1/16 in. Save this step for last - otherwise handling the refill during the other step may cause ink to be squeezed out from the fresh-cut barrel onto your hands.